In this guide, I will show you how to install SPMC on Amazon Fire TV. 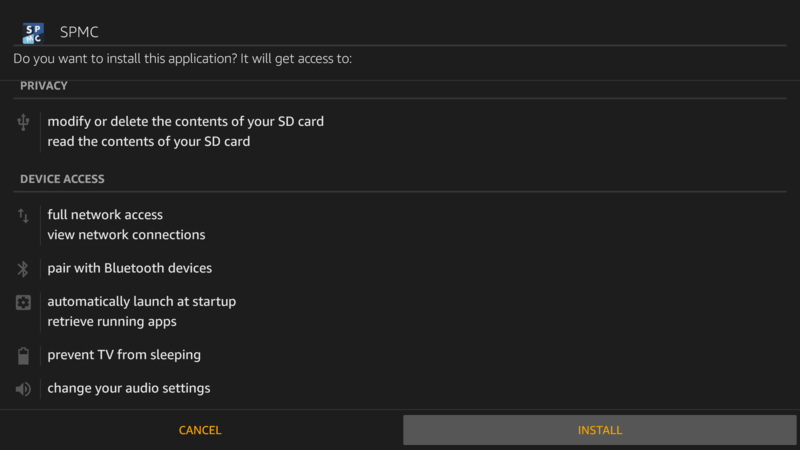 These are several methods to install SPMC on Fire TV, but the method described here needs only your Fire TV device and no computer or ADB connection. Semper Media Center (SPMC) is a Kodi alternative, better optimized for Android platform. The Kodi Team recently announced that if they do not find an Android developer the Android version of Kodi may die. This has resulted in more traction towards SPMC. Due to SPMC's better performance over Kodi on AFTV, I decided migrate from Kodi to SPMC on all my Android devices at home. So let us see how to install SPMC on Amazon Fire TV without ADB or external computer. The procedure to install SPMC pn Amazon Fire TV using AFTV device only is essentially the same as installing Kodi on Fire TV using ES File Explorer. That method with some very minor tweaks is described below. If all goes well you should be able to setup SPMC on Fire TV in less than 5 minutes. So let's go. 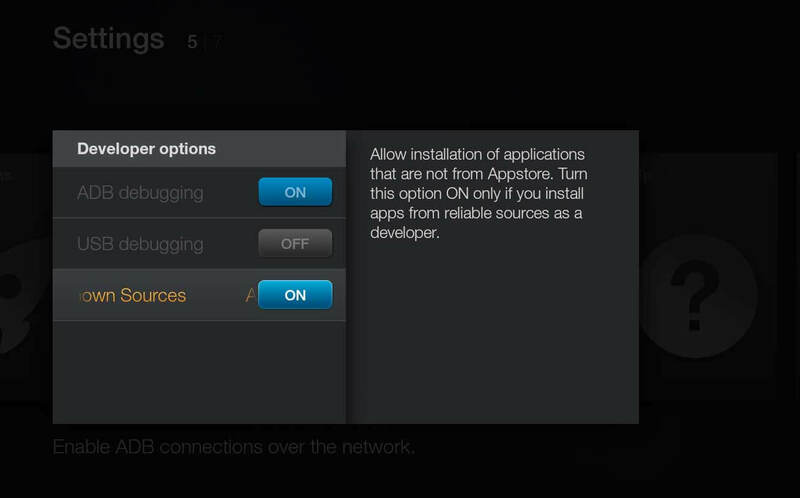 Before you install SPMC on Fire TV, you will have to navigate to Settings -> System -> Developer Options and enable “Apps from Unknown Sources”, as shown in the picture below. If you would like detailed instructions to do this, read my post on preparing your AFTV or Stick for installing unofficial apps. “ADB Debugging” may remain ON or OFF, but I recommend leaving it ON so you can install FireStarter on AFTV and make launching SPMC easier. You may sideload SPMC through adbFire but that is a bit cumbersome compared to this method, which uses ES File Explorer to install SPMC on Fire TV. 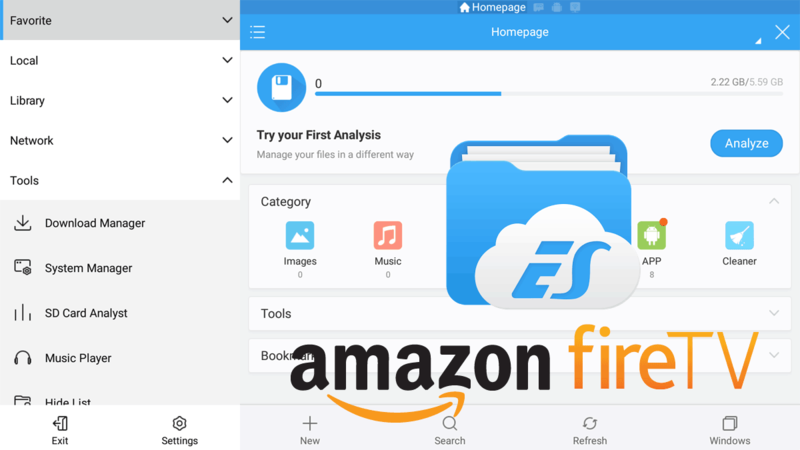 ES File Explorer is in our list of 10 best Apps for Fire TV. There are couple of ways of installing ES File Explorer on AFTV. 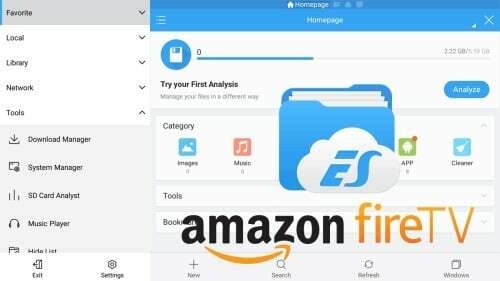 You can login to your Amazon account, open ES File Explorer on Amazon App Store, and deliver it to your Fire TV device. Or, search and install ES File Explorer from AFTV search screen. 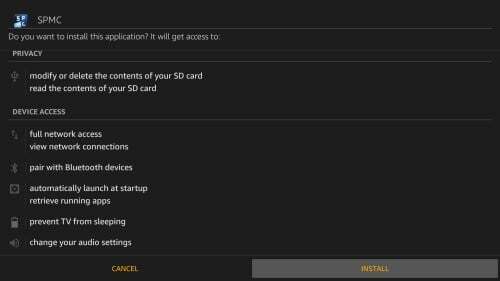 If you need detailed instructions, you may follow my guide to install ES File Explorer on Amazon Fire TV. Now you are ready to install SPMC on Fire TV without ADB. Next step is to add SPMC download source to ES File Explorer. Open ES File Explorer and click through the first-time tutorial. Click on “Favorite” and then “+ Add” as shown below. For “Path” provide https://www.smarthomebeginner.com/aftv and for “Name” provide anything you can recognize (eg. htpcBeginner AFTV Links). Finally, click “Add”. The newly added favorite location should appear on your left menu. Click on it and our Links to sideloadable AFTV Apps should open on the right side. Update (July 6, 2016): It appears that Amazon has blocked downloading APK files. If upon clicking APK link ES file explorer closes, try downloading the ZIP file. Update (June 13, 2016): I removed the download links to ZIP files. Downloading and installing APK files as shown in the picture above will work 100% if you do it correctly. After clicking APK download link, click on “More” and then “Open in Browser” as described below. Update (June 14, 2016): Many of you wanted the ZIP files back. These app install links add 300 GB of bandwidth PER DAY!!! It is costing me lot to host those. For now, I have added ZIP file links from MediaFire (mouse use recommended). 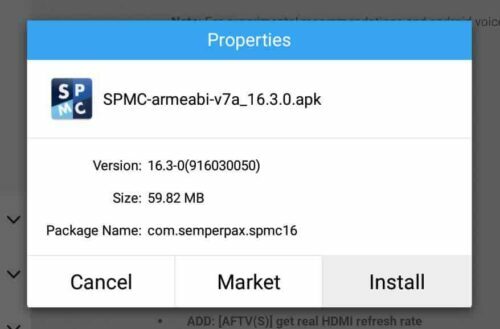 Scroll down, find and select the APK link for latest SPMC version, as shown in the picture above (follow steps 1 to 4 in sequence). You can use the AFTV remote direction keys and navigate to and click (it may take a few moves to highlight the correct link). Download the SPMC APK file from any of the available mirrors. Downloading from some mirrors may require the use of a wired or wireless mouse, which makes clicking on download link easy compared to hit or miss navigation with Fire TV remote. This will download SPMC on Fire TV (you may have to wait a few seconds for download progress window to pop up). 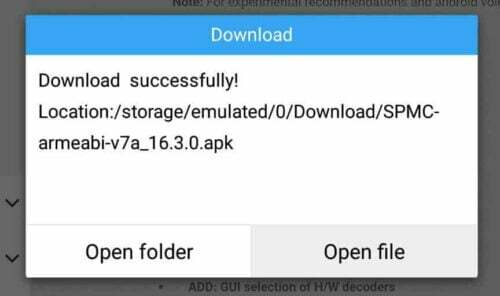 If the APK file does not download or open, download the ZIP file. Depending on your internet speed, it may take a while to download SPMC APK on Fire TV or Stick. 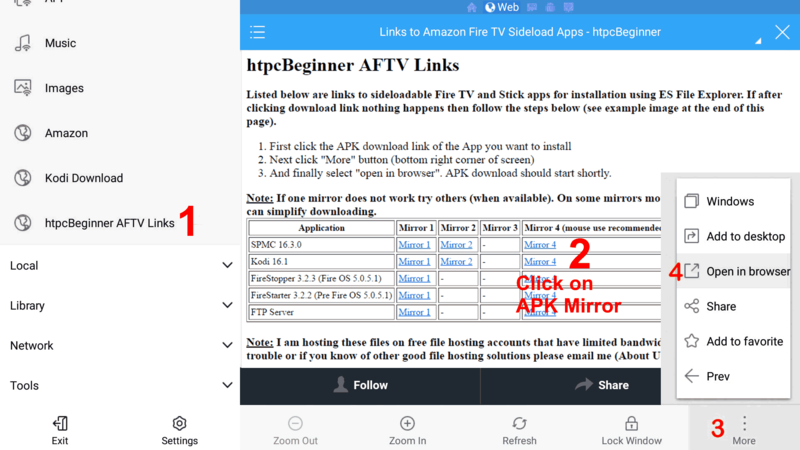 Once SPMC APK download is complete click “Open File” in the window that pops up (as shown in the picture above) to install SPMC on Fire TV without ADB Fire app. If you downloaded the ZIP file, navigate and click on it in ES File Explorer. 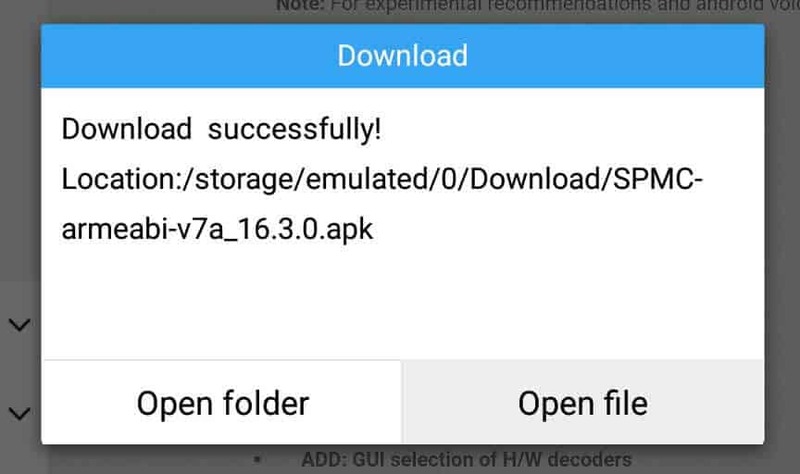 Select and open the APK file present inside the ZIP file. In the next window after opening the downloaded SPMC APK, select “Install” to begin SPMC setup on AFTV. The Android App Installer should open up, as shown below, providing the privacy and device access details of SPMC App and prompting you to confirm SPMC installation. Click “Install” once more to continue with SPMC installation on FireTV. Finally, open SPMC to ensure it works works. If you did not click “Open” at the end of Step 4, you can launch SPMC from Settings -> Applications -> Manage Installed Applications. 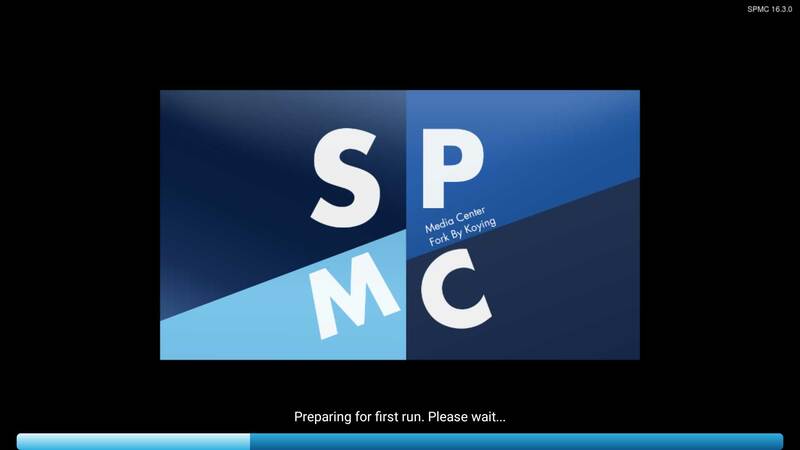 SPMC should successfully run for the first time as shown below. Launching SPMC from settings menu can be cumbersome. I recommend installing FireStarter alternate launcher to make launching sideloaded apps and system apps easier. Now that you have installed SPMC on Fire TV without ADB or an external PC check out our AFTV Kodi Beginners Guide for ideas on what to do next (SPMC looks and works the same as Kodi but performs better). 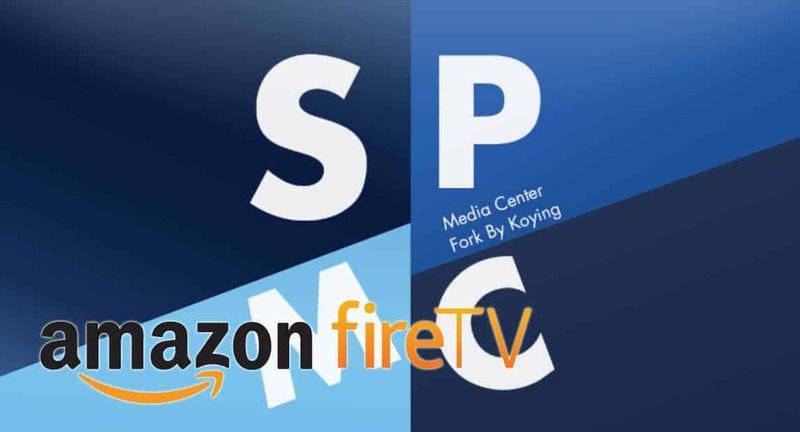 Go ahead install SPMC on Amazon Fire TV and enjoy the better version of Kodi.